How should you play with your hamster? Playing with a hamster takes a different set of skills from the typical pets like cats and dogs, but once you get used to their needs they will provide a lot of love and enjoyment for the whole family. Outlined below is all the information I found while researching this question and should provide you all you need to know in order to be able to safely play with your hamster. When playing with a hamster it is important to consider his (or her!) safety first. Always have clean hands when handling your hamster and be in a safe and secure area. Playing with a hamster can be as simple as letting the little guy (or girl!) climb on you. It can involve an exercise ball for exploring your home, tunnels, mazes, swings, and blocks made of wood, minerals, or salt. A hamster playpen would restrict access to the whole room while allowing for more freedom of movement to enjoy some of the toys mentioned previously. Who knew there were so many options for playing with your hamster? 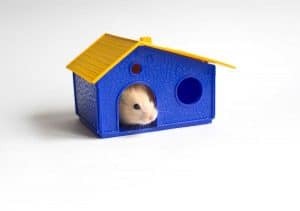 Each of the items mentioned briefly above, as well as safety concerns, are explained in more detail below so that you can dive into the world of hamster playtime and get everything you need to make it enjoyable for you and your new furry friend! A hamster is a very small and fragile animal and can easily be injured. Always be gentle when handling one! Here are some important guidelines for playing with your hamster in a way that’s safe and fun for both of you. Before handling your hamster, always wash and dry your hands. Once your hands are dry, rub them in the hamster’s bedding so that they will smell like the pet’s typical environment and promote a feeling of security (this is especially important if the hamster is new to your scent!). Hamsters do not have great eyesight and rely on their noses to help them know about their environment. If you do not have clean hands, they might not realize you are the one touching them and react in a strange/unusual way. Hamsters are crepuscular animals, meaning they tend to be more active at dawn and dusk (I definitely learned a new word doing this research!). Keep this in mind when you plan your playtime, try for times when he/she is bright-eyed and alert in the cage. If your hamster is sleeping, do not wake him/her up to play with you. Do not force your hamster to play with you, just like us they will have times when they prefer to be left alone. 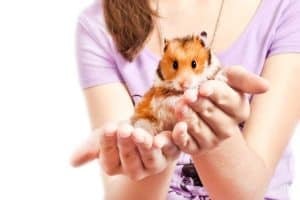 If you try to force the interaction it could lead to the hamster associating your scent with negative interactions and lead to an increase in bites and accidents when you handle your hamster. Never walk away from your hamster when he/she is out of the cage. This is a time for you to spend together, if you have to leave the room make sure to put your hamster back in the cage to avoid any accidents. Make sure the toys you are using have no sharp edges as this could hurt your hamster during playtime. If you’re making or buying new toys, keep safety in mind. Make sure you never bring any toxic materials into your hamster’s environment and that the toys can’t injure your hammy. If you are allowing the hamster out of the cage, you need to have any other animals secured in a different area so that they cannot accidentally harm your hamster. Also, check for any trash or other debris that could potentially be swallowed and hurt your hamster’s stomach. You do not want to put your hamster in an area that is high off the ground or where the hamster could fall off and hurt himself/herself. Make sure the area is flat and any climbing toys do not get too high for the hamster to safely get off of. When you return your hamster to his/her cage make sure that all doors and clasps are closed and secure. You don’t want your hamster venturing out on his/her own before you check on them the next time. They are super difficult to find when left to roam on their own! Now that we know how to keep everything safe, let’s look into making this fun as well. You can use playing with your hamster as your bonding time. This is when your hamster gets to know and trust you. Do not grab your hamster suddenly, this might scare him/her and a hamster’s only line of defense, in that case, is to bite. If your hamster is new (or gets nervous easily) always keep him/her close to the ground so if it jumps out of your hands it won’t get hurt. For the first few playtimes, allow your hamster to use you as a climbing area, be sure you are sitting and in a safe area in case the little guy (or girl) gets too adventurous! This helps him/her adjust to your scent and bond with you. From here, there are many different options for play items you can incorporate into your playtime. There are many different types of toys you can purchase (or create) to help your hamster have an enjoyable play session with you! Be sure to rotate which toys you provide at each playtime so that your hamster doesn’t get bored. These balls are made of plastic and close up to keep your hamster securely inside. These allow the freedom of being able to roam around a room without you having to worry about losing your hamster. If you choose to use a hamster ball, make sure to limit him/her to 10-15 minutes so he/she does not get dehydrated or have an accident inside the ball. When ball time is finished, be sure to give your hamster food and water as he/she will likely need it! You can use a large cardboard box (or even the lid) to create an enclosed and secure place for your hamster to run around and play with his/her toys, or you can buy an elaborate playpen they sell at pet stores. It is important to note that while your hamster is secure in this area, he/she might get adventurous and try climbing out, so you still need to supervise your hamster! Place different items within the space you are allowing your hamster to run around in. He/she will find this entertaining and have fun running around the obstacles, and even climbing over them! You can use regular household items, his/her toys, or anything that is safe and not too tall for the little guy/girl to have fun with. Your hamster not only enjoys chewing on things, but it is important for keeping his/her teeth filed down. Have something on hand that satisfies your little guy’s (or girl’s!) inclination to gnaw. Pet stores have different chews made of wood, mineral, or salt in many different forms so that your hamster doesn’t get bored from always chewing the same thing all the time. If you prefer making your own chew toys, untreated and unpainted pieces of wood are a good option, as are pieces of a dog biscuit or the shells of walnuts. Sometimes your hamster will be crafty enough to give you the slip, as soon as you realize he/she is missing start looking! Be sure to close off the room where you were playing with your hamster to limit the locations he/she can get to. Check all the places hamsters are most likely to hide—the quiet dark areas of a room: under/behind furniture, corners of a room, inside drawers/boxes/etc. If you haven’t been able to find your hamster try this trick: place the hamster’s cage on the floor in the area you lost the hamster. Put some food and water near the door of the cage to encourage the hamster to return to his/her safe space. Taking your hamster outside is a controversial topic. Many people say you can, but keep in mind that it is difficult to secure an area when you are outside. The temperature cannot be too hot or too cold, it should be dry weather, and you should definitely check for any predators prior to letting him/her out of the cage. If you choose to take your hamster outside, be very aware of your surroundings! If you use the hamster ball, keep in mind the small enclosure will heat up quickly in the sun so you won’t want to let your hamster be in there very long at all. Most people choose to just avoid taking their hamster outside to avoid all of the extra concerns associated with this kind of outing. If you’re still considering that, take a minute to read our guide on Getting your hamster out of its cage. It includes a section about getting your hamster outside too. There seems to be no end to options for how to play with your hamster! The biggest takeaway (at least for me) is that anything works, as long as you respect your hamster’s needs. Something to gnaw on, something to run through or around, and a safe space to do so should create a very happy and healthy hamster and some wonderful memories for you!